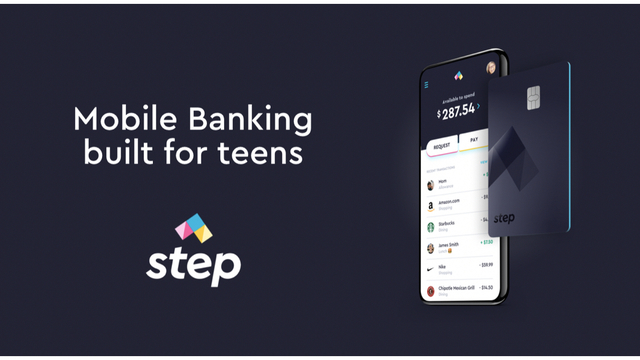 SAN FRANCISCO–(BUSINESS WIRE)–Jan 31, 2019–Step, the new modern-day financial services company built for families and teens, unveiled the industry’s first all-in-one banking solution that integrates certain key features and benefits of checking, savings, credit, and debit cards into one easy-to-use account. By offering a platform for teens’ financial needs, families can work together to guide their children towards financial independence. Step is backed by Crosslink Capital, Collaborative Fund, and Sesame Ventures, and it is working with Evolve Bank and Trust to develop this first-of-its-kind offering. Last year, Americans paid approximately $329 per person in general account fees. An additional $34 billion was charged in overdraft fees, with college students specifically accounting for $700 million. Factoring in that the average college student graduates with $5,000 in credit card debt and $35,000 in student loan debt, young consumers are facing significant financial hardship as they enter adulthood. The primary cause is a lack of financial knowledge and tools to show how to save, spend, and budget responsibly. Step aims to remedy the problem by enabling parents to teach kids about money and the balance between spending and savings at an earlier age while still giving teens the means to do the things they want with ease and flexibility. Additionally, Step provides a high level of security and control over cards and accounts. Teens and their parents can receive real-time alerts, instantly freeze or unfreeze their card, and block international purchases or ATM usage at any time. Step was founded by a team with 50+ years in combined financial technology experience from companies like Gyft, First Data, Square, and Google. The company has raised $3.8M in seed funding from Crosslink Capital, Collaborative Fund, and Sesame Ventures. Crosslink general partner, Eric Chin, has joined board of directors. Starting today, parents and teens can sign up for the Step waitlist and begin earning money by inviting friends. When you invite a friend, you each get $1 in your account when your friend signs up. The company plans to roll out access to the Step platform on a first-come, first-served basis starting this Spring. To learn more and to sign up for early access, please visit www.step.com or download the Step iOS or Android app.